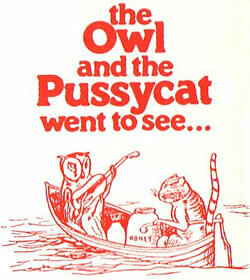 The Owl and the Pussycat set sail to find a ring and someone to marry them (THE OWL AND THE PUSSYCAT). (THE SONG OF THE DONG). He takes them on a journey, accompanied by the Runcible Spoon to protect them from the villainous hungry Plum Pudding Flea (OFF WE GO). Dong meets Professor Bosh and joins his Plum Pudding Flea hunt (OFF WE GO - REPRISE). (HONEY SONG). It works! (I'M STUCK). He is nearly netted by Professor Bosh but escapes, leaving them stuck in the honey. (FROM THE STORM). The mad Jumblies are washed ashore in their sieve (THE JUMBLIES SONG) and lick Professor Bosh and Dong out of their honey trap (HONEY SONG - REPRISE). Hearing there is an owl, Jumblies' favourite food, on the island, they rush off to find him, pursued by Professor Bosh. Dong has found his beloved Jumbly Girl once more (A SYLLABUB SEA). Owl, Pussycat and Quangle Wangle find the Turkey's house. The sleepwalking Runcible Spoon again saves them from the Plum Pudding Flea and they all meet the vicar (THE TURKEY'S SONG ) who forgets the wedding service. 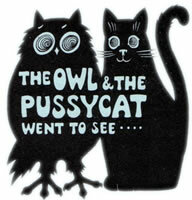 Owl and Pussycat hope to be married soon (A SYLLABUB SEA - REPRISE) but the Jumblies arrive and attack Owl; the five pound note saves him. 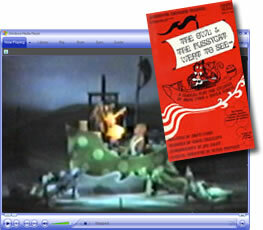 The musical play by David Wood and Sheila Ruskin is narrated by Harry Secombe, who also plays the Quangle Wangle. Roy Castle plays Owl and Hattie Jacques plays Pussycat. 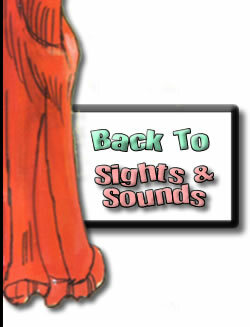 The story and songs are accompanied by a full orchestra. Based on the verses and stories of Edward Lear, this musical play has been popular with professional and amateur companies since its first performance in 1968.